Phillies right fielder Nick Williams celebrates his three-run home run with second baseman Scott Kingery during the sixth inning against the Mets on Sunday. The Phillies, 23-16, currently have the fourth-best record in the National League, and sit a game out of first place in the N.L. East. If they plan on keeping this success sustainable – the operable word here – they’re going to need a healthy, confident dose of Nick Williams contributing. Manager Gabe Kapler and the Phillies saw that on Sunday, when Williams reached down and drove a 2-1 slider to deep right field for a three-run, pinch-hit homer that proved to be the difference in their 4-2 victory over the visiting New York Mets. 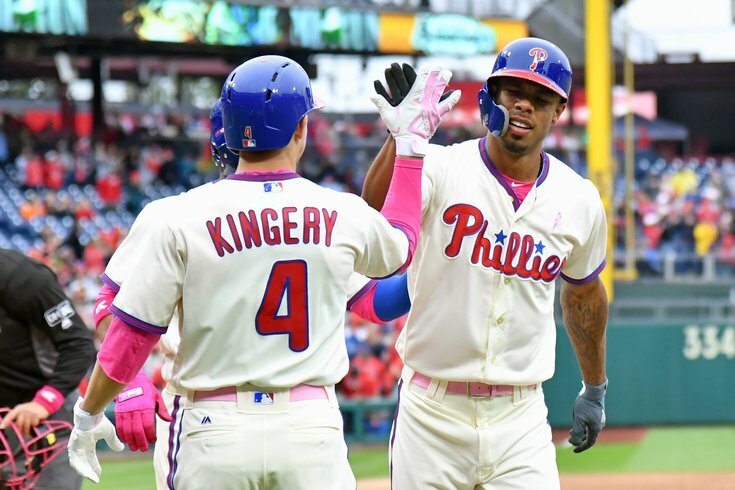 With a two-game series in Baltimore, arguably the worst team in baseball, and then the next seven games against the St. Louis Cardinals and Atlanta Braves, who are a combined 46-30 as of May 13, the Phillies have an interesting stretch of games ahead. And Williams could be a key. He is hitting .229, though this month he’s gone 5-for-15 (.333), with a home run and 5 runs batted in. Williams has been one of the better pinch-hitters in baseball – he’s 7-for-15 (.467) with two homers and 6 RBI – and his seven pinch-hits have him tied with former Phillie and current Los Angeles Dodger Chase Utley with the second-most in baseball, behind the Chicago Cubs’ Tommy La Stella (8). Kapler bubbled over during Sunday’s postgame presser talking about the steps toward maturity that Williams has taken as a person and player. Kapler thought the matchup between Williams and Mets’ reliever Paul Sewald was a favorable one for the Phils. “Nick Williams, what a tremendous job off the bench, what a difficult thing to do, lay the fat part of the bat on the ball and drive the ball out of the ballpark,” Kapler said. “A really impressive at-bat, and it’s a big reward for him over the recent past, he’s really matured. Kapler also likes Williams’ energy level and selfless attitude. Hopefully, this is the beginning of something new for Williams, whether he is starting or coming in off the bench. It was a point of conflict earlier this season when Williams let The Philadelphia Inquirer’s Matt Breen know in early April he wasn’t pleased with his playing time. “To be honest, I’ve just been feeling more and more comfortable at the plate,” Williams said. “It doesn’t matter whether I’m starting or coming in. I’m trying to do the best I can in any position I can, and trying to stay with a positive mindset and grind it out. “I’m being patient. You have to stay in the game. Sometimes it can be difficult as a young player. I know I just have to stay ready and stay loose, because you never know what could happen. It’s tough [staying ready]. Not matter the situation, I try to come through. It feels good [to hear good things from Kapler].